In 8 kilometres from Yalta, near to the well-known lock "Swallow's nest" fine "baby" was sheltered. So in transfer with tjurskogo the name "Kichkine" - the Central tourist centre of the Ministry of Defence of Ukraine sounds. Sleeping cases, a dance pavilion, cafeteria and a summer cinema roll in eternal greens of the park numbering 60 kinds of plants. And modern structures of a camp site are naturally entered in the cascade of wood and rocks. 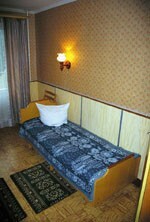 Take places having a rest in double rooms with all conveniences and refrigerators. Energy and health overflow the one to whom has had the luck to have a rest here. The unique combination of sea, mountain, coniferous, wood air cures a body and soul. Even an abrupt picturesque ladder descending to a beach here call "a longevity ladder" - its each step adds 4 seconds of a life! In territory of "Kichkine" to services having a rest own beach, training and dancing (summer and winter) halls, hire of sports and beach accessories, platforms for volleyball and badminton, tennis courts, library with a reading room, a shooting gallery, a massage office, bars. In inter-season period on a camp site can with comfort (warmly, constantly hot water) to take places to 100 persons. During winter time it is invited admirers of mountain skis. On a mountain plateau Ah Petri for them are equipped mountain-skiing lines. Placing in heated shelters, a food, equipment hire, bugelnye lifts. For an additional payment autoexcursions, massage, a shooting gallery, beach entertainments, a meeting - a seeing-off and other services are offered. Base of rest of "Kichkine"
Restaurant, hire of water skis, sledge, surfing, a scuba diving, sea walks on the yacht, excursion bureau, booking of tickets, a bar, connection of numbers to the satellite aerial.